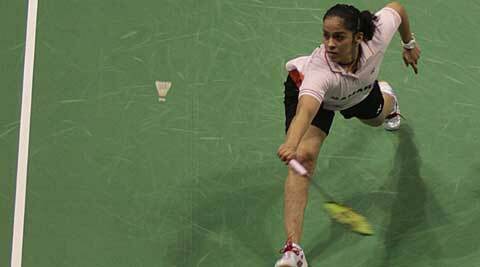 Saina was the only bright spot on a dismal day for Indian badminton as she notched up an easy 21-15 21-6 win. Olympic bronze medallist Saina Nehwal started her campaign on a positive note, advancing to the second round of the women’s singles competition but it was curtains for Parupalli Kashyap and K Srikanth in the men’s singles category of the All England championship in Birmingham on Wednesday. Saina was the only bright spot on a dismal day for Indian badminton as she notched up an easy 21-15 21-6 win over Scotland’s Kirsty Gilmour in a 32-minute match. She will take on US’ Beiwen Zhang in the second round. Commonwealth Games bronze medallist, Kashyap played his heart out before suffering a 21-14 19-21 17-21 defeat against fifth seed Kenichi Tago of Japan in men’s singles match that lasted for an hour and 15 minutes. Thailand Open GP Gold winner Kidambi Srikanth too could not cross the first hurdle and went down to Japan’s Kento Momota 11-21 15-21 in another men’s singles match. Indian mixed doubles pair of Tarun Kona and Ashwini Ponnappa also fell in the opening round, losing to fourth seed Danish combo of Joachim Fischer Nielsen and Christinna Pedersen 13-21 16-21 in just over half an hour. Among other Indians, men’s singles player Anand Pawar and women’s doubles pair of Jwala Gutta and Ashwini Ponnappa could not cross the first hurdle in the qualifying round. Seeded No 1 in the qualifiers, Anand squandered a one-game advantage to go down fighting against Indonesia’s Andre Kurniawan Tedjono 21-18 13-21 19-21 in an hour and eight minutes match. Commonwealth Games Gold medallist pair of Jwala and Ashwini also failed to tame the Chinese combo of Jin Ma and Yuanting Tang as they went down 21-14 15-21 17-21 in a match that lasted 54 minutes.